Oh what a tangled web Nvidia partners weave! From fancy coolers to factory overclocks, there are many Nvidia partners to choose from when selecting a video card. The 560 Ti OC2 offering from PNY does not come in a fancy, price raising brief case that looks like it holds 13 different board games, nor is it shaped like a gun with a video card inside. One also will not see two gentlemen in suits with ear pieces sporting aviator glasses dropping this off on your door step (though a blue, brown, or green and purple guy/gal just might! ), but that’s ok. You are going to have to order it online or get off the couch and into a store to go get it. But because of that, you will likely save a few bucks. 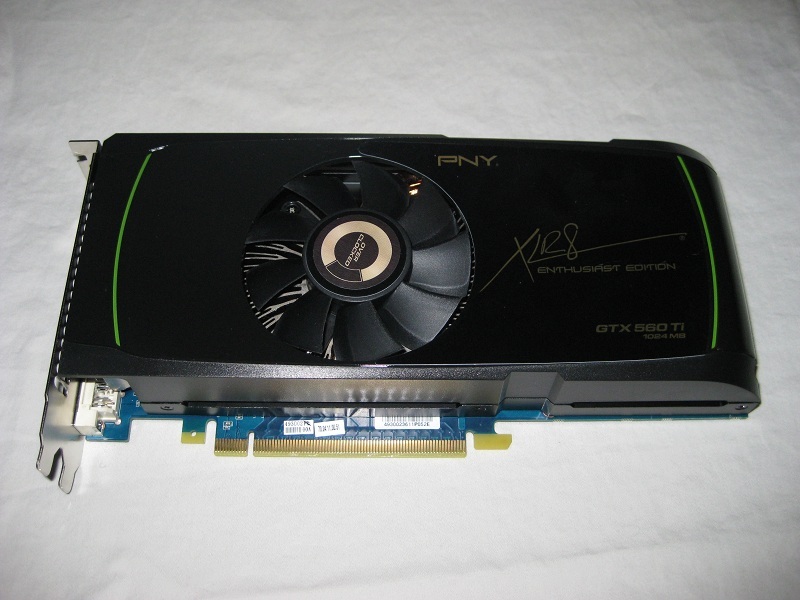 PNY has graciously provided us with 560 Ti OC2 review sample and will attempt ‘XLR8′ our money towards their camp. Let’s see if its worth the purchase over other partners’ cards. Texture Fill Rate 57.6 Billion/sec. Below are some pictures of the hardware. PNY 560 Ti OC2 showing off its blue PCB. PNY 560 Ti OC2 sporting 2 6 pin PCIe power plugs. PNY 560 Ti OC2 - 2 DVIs and one mini HDMI port. 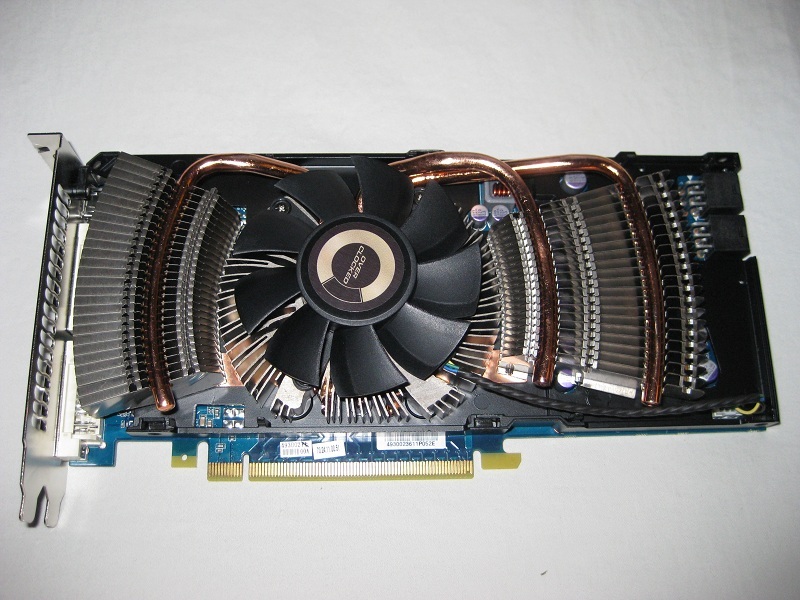 PNY 560 Ti OC2 - Naked showing off its cooling pipes. 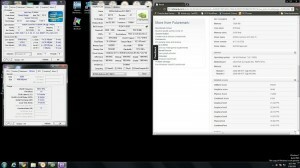 i7 2600k @ 3.4Ghz and 4.5Ghz (5.2Ghz for max testing). 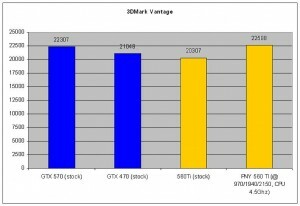 2 x 2GB DDR3 2000 @ 2133Mhz 9-11-9-28 (baseline testing). MCP655 (vario), 5 Yate Loon High 1200 fans, DVD R/RW Optical drive, Lamptron FC-5 fan controller. All scores seen here were the middle score of 3 runs (discarded lowest and highest). Any anomalous scores were discarded and the process repeated. GTX 570 and GTX 470 at stock clocks and CPU (3.4Ghz). 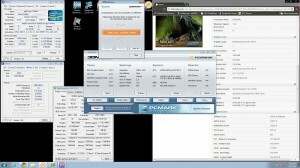 All 3DMark benches were run at default settings. Unigine Heaven benchmark was run using the Hwbot version, both DX9 and Dx11. Alien vs Predator was run at 1920×1080, Shadows =3, DX11 Tessellation ON, DX11 Advanced Shadows ON, Anisotropic Filetering = 16. Low quality = Texture quality 2 and DX11 MSAA samples 1, High quality = Texture quality 3, and DX11 MSAA samples 4. Stalker: COP was run at 1920×1080, Ultra, DX11. Each test was then run as follows: No Tess / No AA, No Tess / 4xAA, Tess /4xAA. PNY 560 Ti OC2 - On the test bed. In these benchmarks, more CPU speed doesnt have as dramatic of an effect like the previous set of benches. One thing you can see is that the 560ti is still trading punches with the 470 at similar CPU clockspeeds. 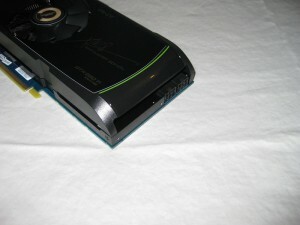 Add more of both and it begins to pull away and gets closer to its big brother, the GTX 570. Last would be some game benchmarks: Alien vs Predator, Stalker: Call of Prypat, and Aquamark 3. Alien vs. Predator (Low quality). Alien vs. Predator (High quality). Stalker: COP - No Tesselation, No AA. Stalker: COP - No Tesselation, 4x AA. Stalker: COP - Tesselation, 4x AA. In the game benchmarks, the PNY 560 Ti barely beats out a GTX 470 with the same CPU clock speed. Again, add more of each and that lead will grow. 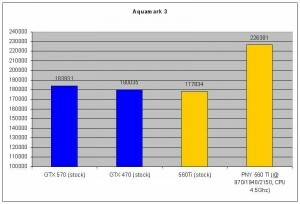 Aquamark 3 is a very CPU bound benchmark and speeds falls slightly behind the GTX 470 when at stock. Again, add a lot of CPU and more GPU clocks, and look at that score skyrocket! Don’t forget, you can overclock both the 470 and 570 as well, bringing things back in line. 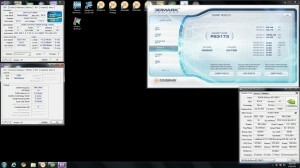 The point of this type of testing was to show performance at typical overclocked speeds on both CPU and GPU. Below you can see what this card can do with a 5.2Ghz Sandybridge rocket strapped to its back in popular synthetic benchmarks. The results didn’t differ much in 3dMark11, but we saw nice gains across the board in the other benchmarks used. There are two camps in regards to how far a preoverclocked card can go. On one hand there is a group that states these cards are binned and should overclock higher than a regular stock clocked unit. The other camp, in which I reside, is that they are just binned to reach their target speed which is determined by the company and yields. With that thought the cards have just as good a chance to clock as high as any other. In this case, I was able to push the card to about 930Mhz Core/1860 shader with stock voltage (1.0v). I was able to run some benchmarks and games at 990Mhz core/1980 shader with 1.15v (max in Afterburner). Not too shabby! 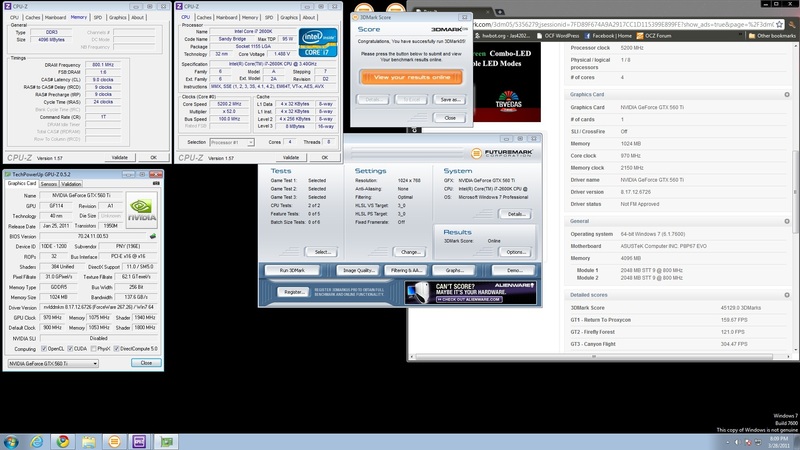 However, to run all benchmarks with no freezing, I had to ease on back to 970Mhz. Personally I was a bit disappointed in this sample seeing there were cards that hit 1k+ core speed on hwbot with stock cooling. But an overall overclock of nearly 150 Mhz from the reference clocks is pretty good. As for the memory, I was able to get it up to 1180Mhz from its stock of 1050 for all testing. The memory may have more headroom in it as I didnt spend much time on tweaking that. I would certainly like to have seen more core clocks out of this card though (1,000Mhz please!). This is a cool running card from the Nvidia camp. The quad heat pipe cooler is quite effective. Just know that it will dump the majority of the heat load inside your case. With a 75% fan (highest my Afterburner would go) temperatures never broke 73C with an ambient of around 24C in my testing. At stock clocks and voltages, the card never went past 65C. On idle speed (40%) the fan is nearly inaudible even on my open benching station 3 feet away and showed temperatures of 33-34C. However once the fan speed ramps up to around 55% or more you can really hear a nice hum coming from it (note it’s not the air) that varies in pitch with the RPMs. Thats not to say a little music or gaming wont drown it out, but this fan has its own tone for sure. 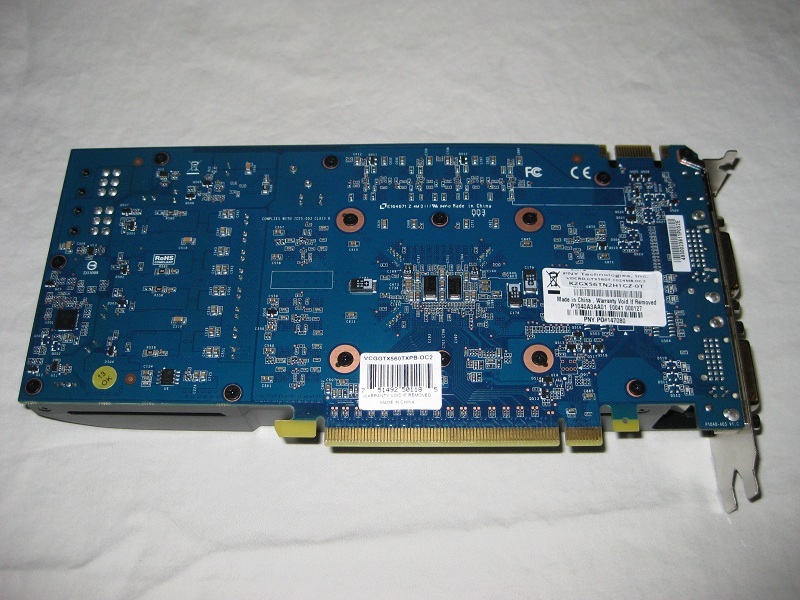 As far as power consumption goes, the TDP on this card is 170W in reference clock form. 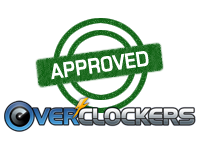 I would imagine that number to be a little higher with this overclocked version. My system peaked at 364W according to the Kill-A-Watt meter when running 3DMark Vantage. That was at the full 1.15v and 970Mhz Core clocks and the CPU at 4.5Ghz. For the performance this card provides, that’s a fairly tame number and easily beats out my old GTX 470, which peaked a bit over 400W. Average consumption through the testing was around 350W or so while overclocked and 340W while at stock. Overall Nvidia has a well placed GPU in today’s market. PNY has stepped it up a notch with one of the highest factory overclocks available in this model. The rather plain cover with just the “XLR8 Enthusiast edition” writing and its namesake may make this card appear a bit bland. For my personal taste however, that’s just fine. No neon or other ‘bling’ for this writer! The sound levels are acceptable even on an open benching station just a couple of feet from my ears. The fan on idle is nearly inaudible, but once you start to ramp it up, the blades do sing its own little song that ebbs and flows to the RPMs. Wind noise is minimal when on max fan speeds, but dont let that fool you in to thinking the cooler isn’t effective as it keeps temperatures well under control with its max clocks and voltage. The performance this card provides for the price is solid. You can see the performance is on par or better than a GTX 470 in benchmarks. 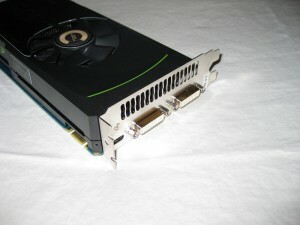 The 560ti has lower power consumption as well as noise when compared with the 470. I would be quite happy to keep this as my daily driver as it powered through my games like BFBC2, Dirt2, and COD:BO at 1920×1080, 8xAA/16xAF at the highest quality settings (games were not benched as they have no built in benchmark outside of Dirt2). One can find the PNY 560 Ti OC2 model at newegg.com for $249.99. 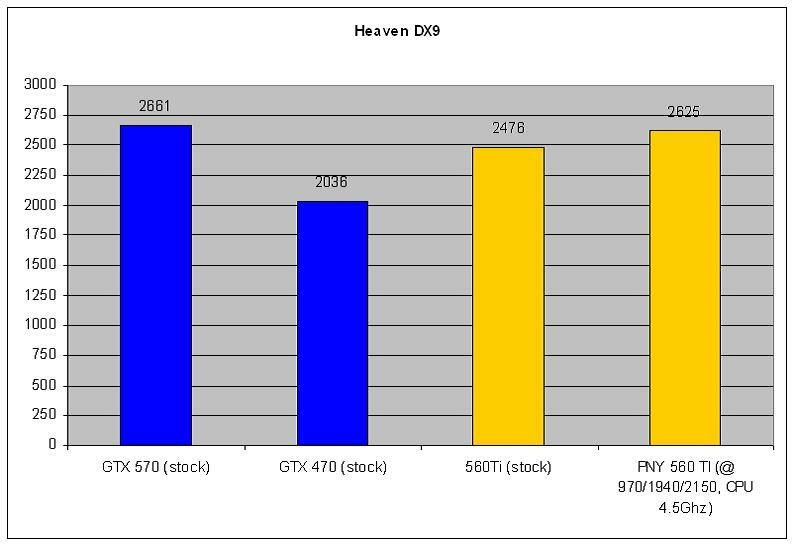 At that price it’s competitive with the 6950 (note it was never meant to compete with that card) and beats out the lower priced 6870 as it should. The GTX 470 is also priced around $250 for around the same performance, however with better efficiency and power consumption, the choice between those two lay clearly on the 560ti side to me. 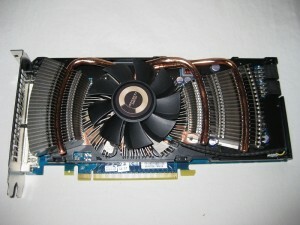 The GTX 570 that was used here is priced considerably higher at $350 and really in a different class. 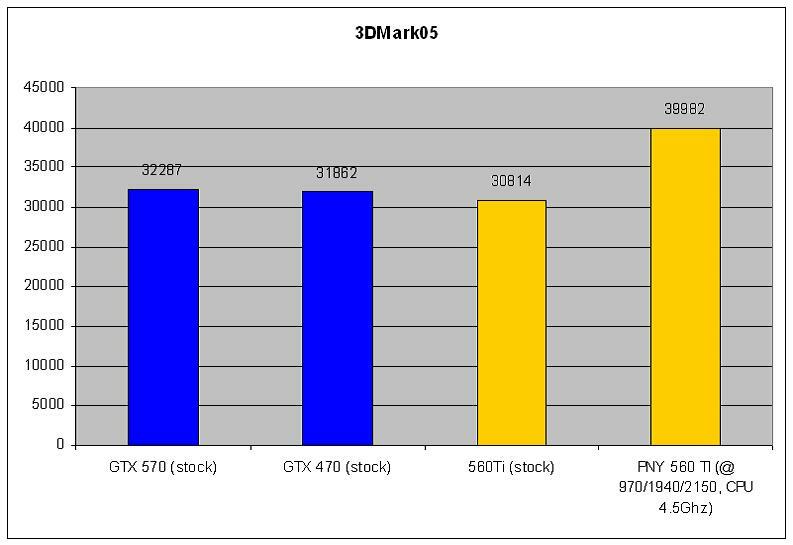 Nvidia has found a nice home for this card in the market and its partner PNY sweetened the pot nicely with a 80Mhz factory over clock on the core and 100Mhz on the Memory while only asking a pittance more ($10) over reference clocked cards. They also offer a lifetime warranty for the original purchaser once the card is registered. If you add all that up, I feel this brand should be on the short list for consumers when choosing a 560 Ti. I've had good luck with the PNY XLR8 line. The problem is if a bnechmark shows that information or not. In Stalker:COP, it does, and we can include that, but other game benchmarks dont give that information out. fraps was the only thing i knew/know about to be able to do that. Wont fraps slow down the benchmarks though? I recall hearing that happen... Im looking for a way to record it, without affecting the bench. not unless the benching/gaming community can some how get game makers to include low/avg/max. 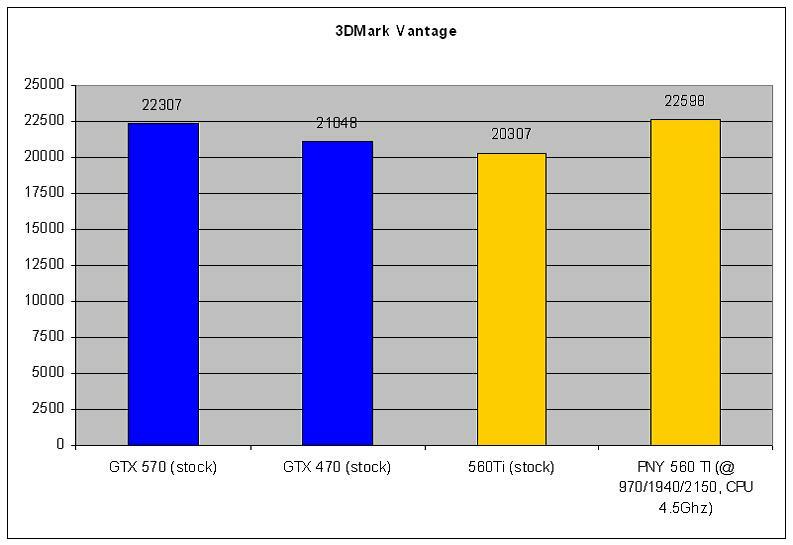 I like PNY cards, but i wish theyd stop using that blue pcb, over here in the uk the only brands the shops seem stock for graphics cards if PNY.